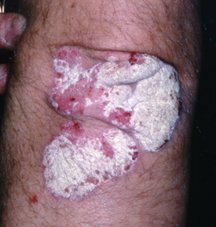 Psoriasis may develop as a result of an abnormality in the body's immune system. The immune system normally fights infection and allergic reactions. Vitamin A derivatives. These are used to treat moderate to severe psoriasis involving large areas of the body. These treatments are very powerful. Some have the potential to cause severe side effects. It's essential to understand the risks and be monitored closely.